2017 is a year of celebration for EBLIDA as it is the association’s 25th anniversary. There were 36 participants at the Council, a good turnout of members coming from 20 countries which is a good representation of the diversity of our representatives. 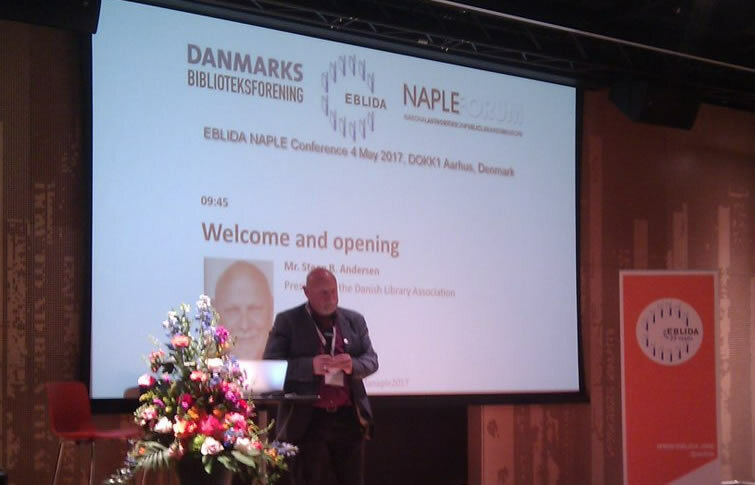 The kind offer to host the EBLIDA and NAPLE conference in Aarhus, European Capital for Culture 2017 exceeded our expectations. 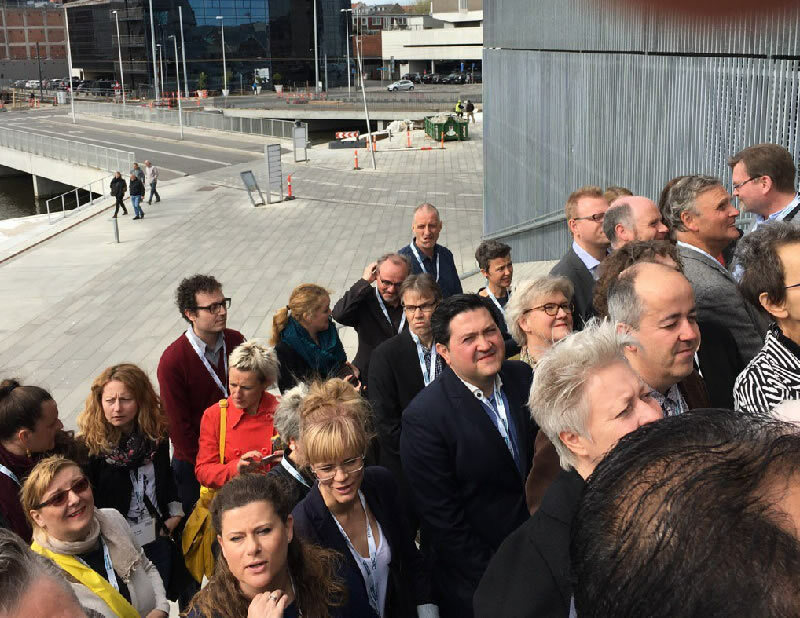 The programme offered a rich variety of speeches, round table discussions, world café and the release of the Aarhus Declaration calling to ”Take Down the Digital Barriers”. Right after the opening speeches from Mr. Steen Bording Andersen (President of the Danish Library Association), Ms. Annette Kelly (NAPLE Chair) and Mr. Rabih Azad-Ahmad, Cultural Mayor of Aarhus, the first session kicked off with the inspiring speech Let’s Rethink by Mr. Henrik Good Hovgaard, Future Navigator. He talked the audience through the challenges and opportunities our societies are experiencing that can be summed-up in the motto “Creepy but Awesome”. A lot of food for thoughts for our future work. 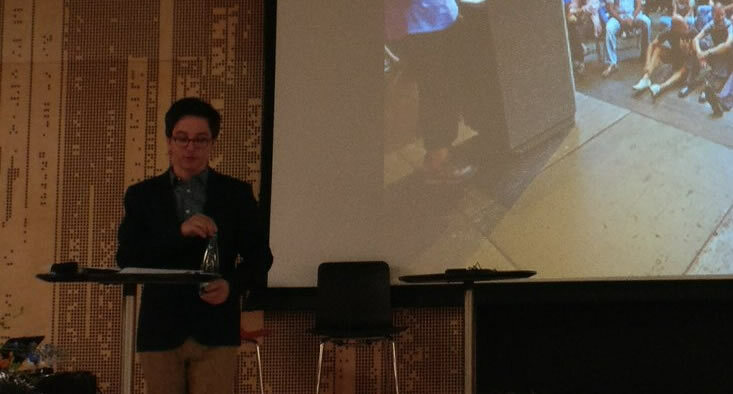 He was followed by Mr Vincent Chapdelaine, Collective Entrepreneur who talked to the audience about Rethinking Libraries calling for more participatory libraries and librarians who invite the citizens to co-create the library with them. Right after the coffee-break, Mr/ Michel Steen-Hansen (Executive Director of the Danish Library Association) moderated the round-table discussion that in addition to the two keynotes speakers included Ms Erin Simon (Product Counsel on the Knowledge team at Google) and Jukka Relander (EBLIDA President). It was a lively discussion among the speakers who had different views on librarians as activists to change the way libraries are working, as well as on the need to update the copyright legislation to keep up with the technological changes. 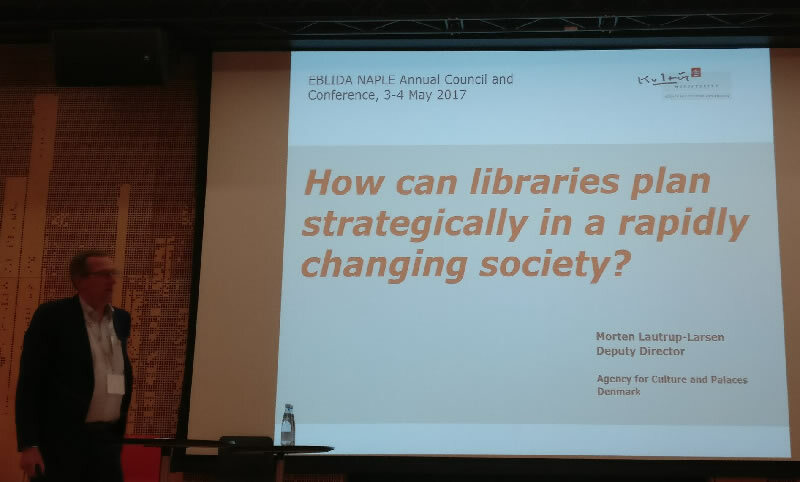 In the afternoon, Mr. Rolf Hapel, Director, Citizens Services and Libraries Aarhus moderated the session 2 on Library Strategy and Advocacy. The session started with two quick presentations. 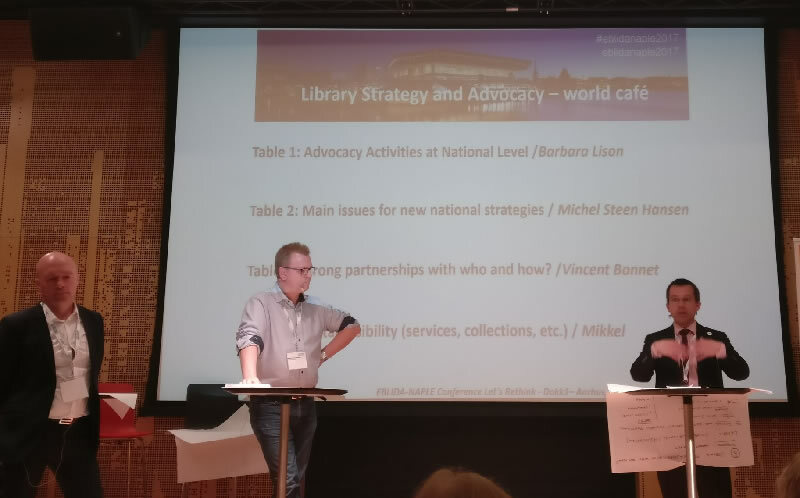 The first one was managed by Mrs. Gunilla Herdenberg (National Librarian, National Library of Sweden) who described the current Swedish Strategy for libraries to be achieved by 2019. She was followed by Mr. Morten Lautrup-Larsen (Deputy Director, Agency for Culture and Palaces) who underlined the need to think strategically to achieve changes for libraries in the future. The world café facilitated the discussions on each topics and allowed participants to cherry-pick each part of the discussion and provide their views and opinions to build on previous proposals. If only one sentence should be remembered, it would be the one from Moderator Mikkel Christoffersen who said “we want to be ambitious on your behalf”. Something that could serve as a motto when we do library advocacy. Participants then enjoyed a sweet treat of a birthday cake to celebrate the 25th anniversary of EBLIDA. Right after the break, Mr Steen Bording Andersen, President of the Danish Library Association and EBLIDA Executive Committee member announced the publication of the Aarhus Declaration 2017: Take down the digital barriers!